Agility is a major consumer of Microsoft's enterprise-grade computing platform, Azure. The entire Agility CMS platform is based in Microsoft Azure, as well as our customer databases and a large portion of the websites built on our platform. "As one of our most distinguished Azure customers, we value your contribution towards elevating the Canadian Cloud. 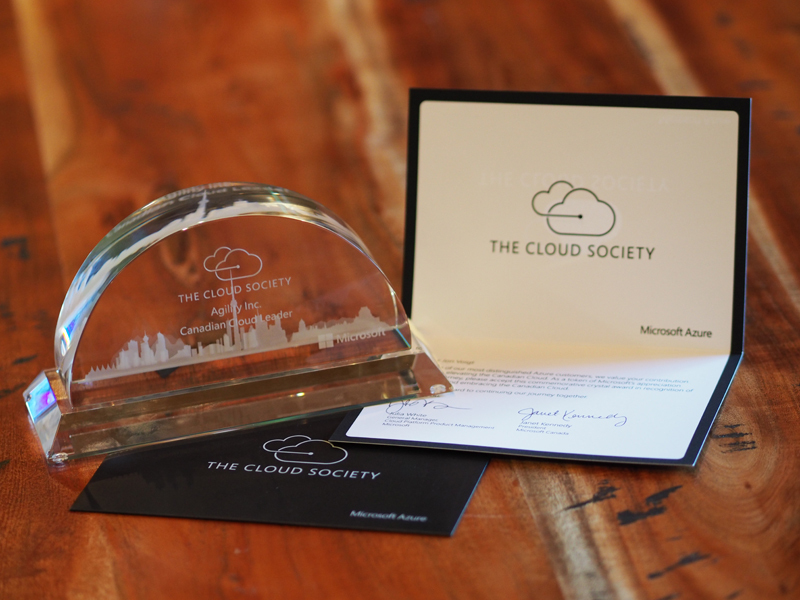 As a token of Microsoft's appreciation of this journey, please accept this commemorative crystal award in recognition of adopting and embracing the Canadian Cloud," wrote Julia White, General Manager of Cloud Platform Product Management, and Janet Kennedy, President of Microsoft Canada. This award comes a year after Agility earned a Cloud Platform Competency as a member of the Microsoft Partner Network. Competencies are attained through a proven history of success within the tech industry and through a demonstrated commitment to customers. In order to earn a competency, partners need to complete and pass rigorous exams that eventuate in Microsoft certifications. Microsoft also requires customer references that demonstrate successful implementation and a pleasant user-experience. Cloud performance competencies are new to the Microsoft Partner Network, and the Cloud Platform competency is one of three newly introduced cloud-based achievements, as currently more than half of all Fortune 500 companies are utilizing Microsoft Azure. The Agility Team is looking forward to working more closely with Microsoft as the company moves into Canada with the introduction of Canadian commercial cloud services and the opening of data centers in Toronto and Quebec City next year.